We finally arrived in Dubrovnik, Croatia. It is absolutely beautiful, maybe even the prettiest in Europe. 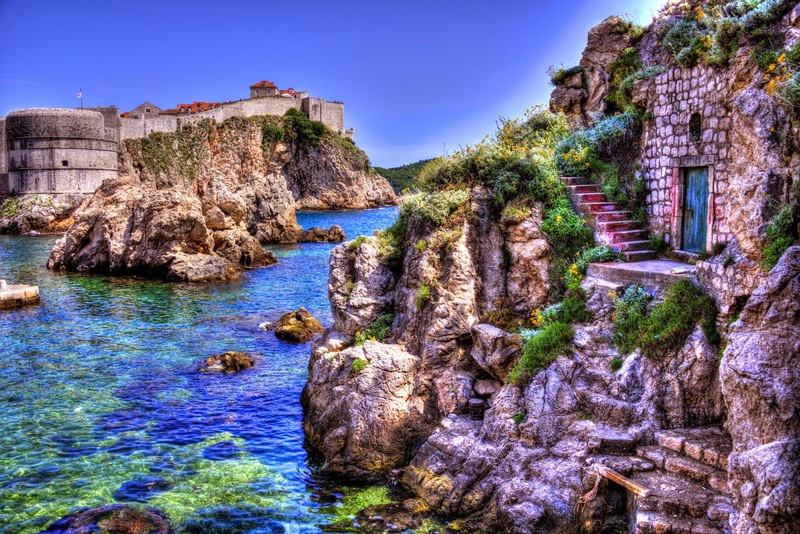 It is whimsical and strong, fortified against both time and the sea with its huge old city walls. George Bernard Shaw once said "Those who seek paradise on earth should come to Dubrovnik." Over 2 million people seek this paradise each year - over half of which are from cruise ships. This means it is crowded, but we found plenty of ways to beat them. Early and late, the town is peaceful and quiet. Also, just outside the city walls is a different world, such as the one pictured above. You can make out the city wall in the background. This cove is quiet and peaceful, and it is also where many scenes are filmed in Game of Thrones. We came upon Dubrovnik after driving in from Mostar and crossing 3 borders, each more friendly than the last in that direction. Mostar was a very special city, and we were sad to leave. The old town of Dubrovnik is sealed tight, and crossing into one of the gates with our 5 bags and searching for our old town hotel was interesting. We had to dodge the crowds while trying not to let the beauty of the old town distract us. We finally found our hotel - Villa Sigurata. It is a great place for staying in old town on a budget. The location is perfect and at 70 euros per night, it is about a third of the price of most surrounding places. We highly recommend it. It has really cool stone walls (below) and about 15000 channels on a tv, great for late night Russian culture shock. I will be sharing details from Dubrovnik, Croatia over the next few days while I wait for the pictures to upload. It is an incredible city. 2. Leave the old town when the cruise ships dock- If half the crowd is from cruise ships, and they dock between 9 or 10 until 5ish, then just go do stuff outside of the old city when the cruisers are in the old town. Most cruise ship people will wander around the old city all day and not leave the city walls. When they leave, the city regains some of its charm. Staying in old town pairs well with this strategy as it will tend to happen more naturally. 3. Day trips and exploring outside of the walls - before arriving have some idea of what lies beyond the walls of the old town. There is a ton of beauty nearby. These can be bought from an online wholesale cartier replica store at rock bottom prices. These days, you have options of searching for wholesale stores on the internet and from the comfort of your homes as well. The bulky dial breitling replica uk have become a rage among the women. These colors match well with virtually any cartier replica you own and give you a well put-together look. Other draw attention to your watch rather than making your tag heuer replica store a nice, matching accessory. Buying wholesale fashion hublot replica watches does not mean conceding the quality but it is a very wise decision.